We said "A Hui Hou" to Hawaii, and we were warmly welcomed in the great state of Texas. While we miss the view from Lil' Puna, it's awfully fun to giggle about Cooter Brown's. Tripp and Beesly are content anywhere, but air conditioning is an added bonus. They miss our daily trek up and down the hill, but they dig road trips and spacious fields for playing frisbee. We got to share some of our favorite places with the people we love the most — Maui and Missouri, anyone? We caught up with old pals and created precious bonds with new friends. We sold our '08 Jetta (The Black Flash) and bought a '14 Jettawagen (The Rig). How original! In our defense, the new diesel is both fuel efficient and family friendly. Winning!!! Flyboy logged many hours in the C-17 and came back with cartons of beer and clever stories. In October, he swapped cargo planes for a trainer and he's had a blast twisting, turning, and flying in formation. While I'm incredibly proud of the work he's done in the wild blue yonder, I had the best time cheering him on as he completed an Olympic Triathlon in Honolulu, and he cycled from the shores of Maui to Haleakala's summit. This wasn't my year for physical feats. Instead, I excelled at mixing Limonata with Hendrick's, spent quality time with Bravo's beloved Andy Cohen, and collected anything covered in polka dots. It's safe to say, I was successful. Some of my favorite moments of 2013 were spent sipping Crewlade with my dear friends at J. Crew on-the-island. Words can't express how much fun I had getting gussied up and being paid to mingle with co-workers and clients who get equally jazzed about colorful cashmere and sparkly baubles. With the love and support of my family, I got snazzy blogger cards, a fancy DSLR, and spent an unforgettable weekend in Austin at Blogshop. I have NO idea what will come of One Fine Day, but words can't express how much it means that my family believes in me enough to provide me with tools and experiences to further my love of blogging — a pet project that has brought me oodles of joy and creative fulfillment. 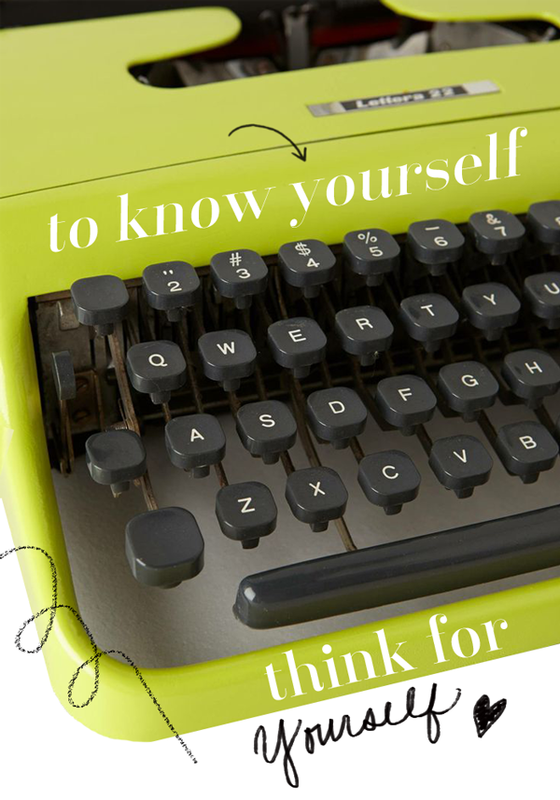 Design and writing make me twitterpated, but blogging has introduced me to so many fabulous people. I'm incredibly grateful to my readers. Thank you for stopping by, commenting, and introducing yourself via email! It's just so nice to geek out about ballet flats and stationery. Cheers to a swell new year! I hope 2014 is brimming with good company, great card stock, and fizzy drinks! P.S. Regularly scheduled blog posts will return on January 6th. It's time to step away from the computer and live a little! Happy Monday, sweet readers! I hope you had a swell weekend baking out the wazoo and picking up any last-minute gifts. We arrived in Missouri on Sunday evening. The "Rig" was chock-full of gifts and luggage. I wish I had a dollar for every time Tripp and Beesly fogged up the windows. Flyboy and I had the air blasting as a preventative measure, which meant we spent the entire trip freezing. Of course! I think our behemoth Berner knew exactly what she was doing because EVERY time we tried to turn off the air, Beesly would wake up from her snooze and begin panting heavily again. She's such a clever gal! I know most of you are prepping for the holiday madness and have very little time for blogs, which is a GOOD thing. I just wanted to check in and share some of my favorite moments from the past few weeks. Obvious highlights include Blogshop and my snazzy camera. I still have SO much to learn about my DSLR, but I'm having a blast toying around with it. While things on the blog front may be rather light over the next two weeks, you can see what sorts of shenanigans we're up to on Instagram. Of course I'd love to have ALL of our household goods, but this time of year has me dreaming about my standup mixer. 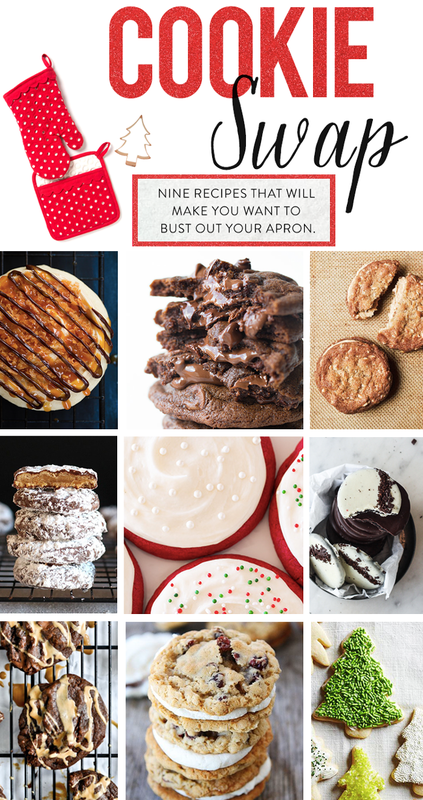 Quite honestly, the holiday season is a free pass to bake excessive amounts of sweets — especially cookies! I typically look forward to December as an excuse to donate confections to the local single airmen. It gives me a reason to test various recipes and bake like it's my job. Because I'm without my favorite kitchen tools, I thought I'd live vicariously through m' blog. After reading about The Nora Ephron Cookie, I'm more convinced than ever that we would be the best of friends! NEED: My husband-to-be and I are currently looking for some fabulous dinnerware to add to our wedding registry. We've got less than six months 'til the wedding and have our eye on this amazing Kate Spade set! I've been in love with Kate Spade's home accessories for awhile now. They are colorful and timeless pieces that will go with just about any type of kitchen we dream up. And the polka dots? Yes, please! 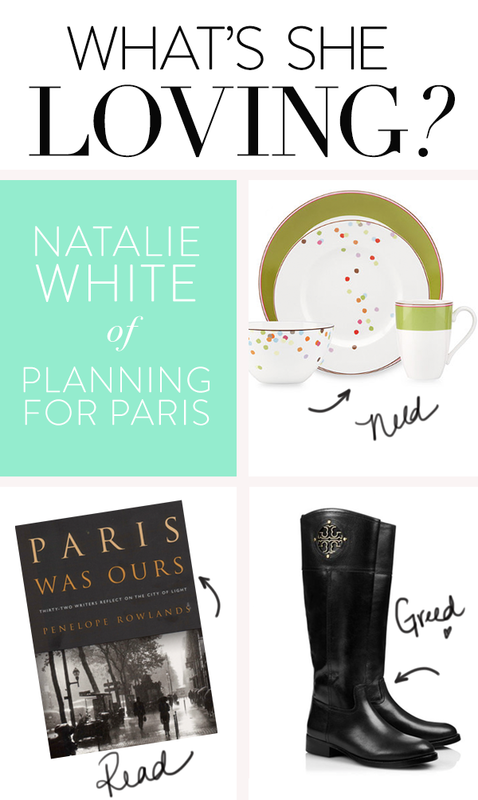 READ: As you can tell from our blog's name — Planning for Paris — my sister and I have quite the obsession with Paris. I originally came across this book at Anthropologie and decided it was a must-have. The book is a collection of essays from different writers, sharing their stories of how they were seduced by Paris and how it changed their lives forever. Doesn't that sound terribly romantic? Hopefully, one of these days my sister and I will be able to add our story of Paris to the collection. GREED: I've been on the hunt for some new boots for awhile now. I usually head to Target and get their latest style, but I've been dreaming of investing in a Tory Burch pair! They are so classic and beautiful. That leather is to die for! I'd be so afraid to wear these beauties outside in the Kansas City weather, but I have a feeling they'd get me through some dreary winter days. They are on sale right now... I might just have to save my pennies and invest! Thanks for sharing, Natalie! I'm drooling all over the colorful dinnerware. Interested in sharing your Need Read Greed picks? Email me. P.S. 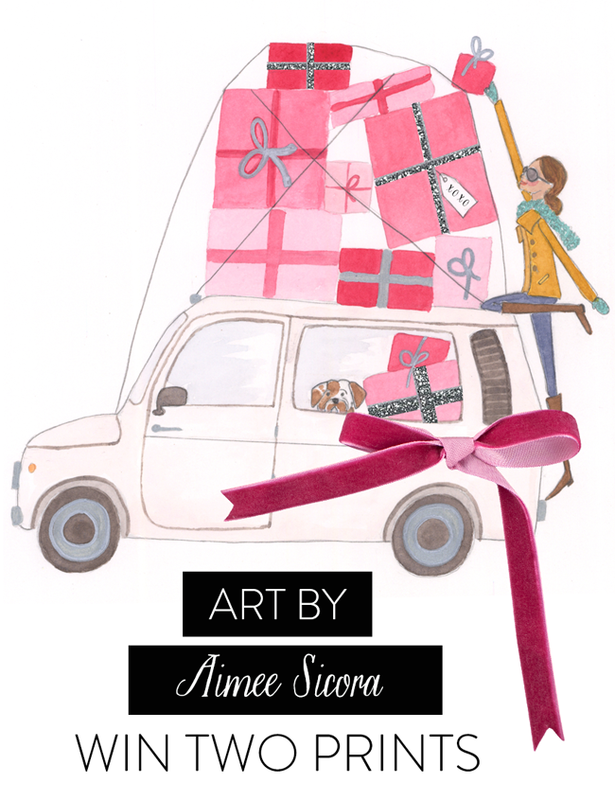 There's still time to enter the Aimee Sicora giveaway! Click here for more details. Note to Self: GIFs make me giddy. 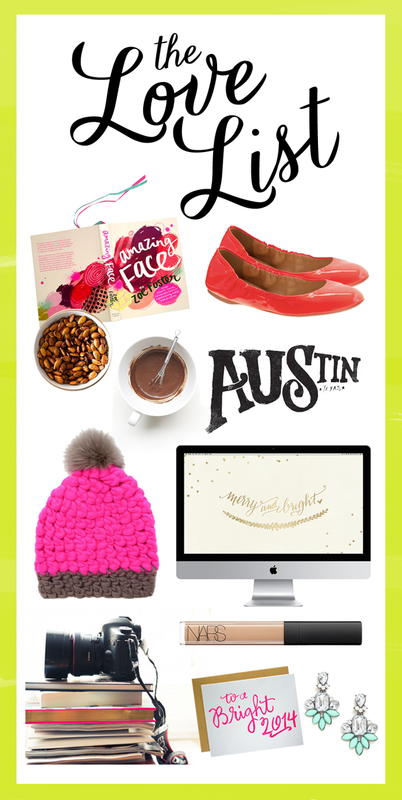 Attending Blogshop Austin has to be the highlight of 2013. Flyboy might laugh at that statement because the night before the workshop began, I was a glass case of emotions. No, seriously. Any time I'm about to embark on something that means SO much to me, I get worrisome and fussy. The silliest thoughts flood into my mind and I get anxious about all the what-ifs. It's ridiculous, really. I'm not the kind of gal who puts herself out there, and while the thought of attending this dreamy blogger bootcamp made my heart skip a beat, it simultaneously made me a nervous wreck. Thank goodness for cute notebooks and sparkly accessories! Ever the timely student, I arrived at the venue approximately 30 minutes early. Punctuality is fantabulous, but the extra downtime has a way of toying with this worry wart's emotions. I kept my cool and watched as others started to arrive. It was REALLY happening! Eek! I gave myself a little zhuooshing, kissed Flyboy goodbye, and headed into the classroom to a state of bloggie bliss. Smiling faces greeted us at the door with mimosas. Treat yo self! Just as I'd envisioned, there was a lovely garland backdrop on the wall, mismatched vintage chairs set up throughout the studio at bright yellow tables; there were dainty flower arrangements everywhere, BKR bottles and Baggus were sprinkled on the tabletops. I was in a design daze. Pinch me! I quickly picked some random seat, sat my bags down, and as soon as I looked up, I saw the blonde mermaid. I'm talking about THE Bri Emery — the blogger and creative genius behind designlovefest, a blog I've followed religiously since 2009. She was chatting with her partner-in-crime, Angela Kohler, an über talented photographer and commercial director. Before I could embarrass myself from gawking, a girl named Jessie was seated across from me. Covered in polka dots and armed with the cutest laptop case, we exchanged hellos and nervously set up our computers. When you're riding this kind of creative high, it's impossible to hide your crazy. Thank goodness, Jessie was just as pumped as I was. She embraced my giddiness and kindly made sense of my cryptic and excited ramblings. Hours were spent listening to Bri and Angela banter back and forth about Photoshop shortcuts, sharing tricks of the trade, and inside jokes. Just when I thought I had a good grasp of the editing software, my mind was blown with just a few simple clicks. I looked around the room, so many jaws dropped in amazement. Amid the oohs and aahs, we all sat hunched over our laptops manipulating images and type. If that doesn't sound like heaven, I don't know what does! We all realized there was a more efficient way to design posts and edit images, leaving more time to actually create original content. Isn't that something? I should attribute any new smile wrinkles to Blogshop, because there wasn't a moment I didn't catch myself grinning like a buffoon. Every time I looked around, I saw someone else geeking out over little details, like the persnickety styling of succulents and catered lunches. There were discussions about personal blog goals and 'grammers bonding over filters, apps, and hashtags. I was with m' people, and I loved it! It's not often that you get the opportunity to be surrounded by others who have such a genuine appreciation for the same things that you do. The joy was contagious. Just as I hoped, I was able to let my guard down and embrace this one-of-a-kind weekend with a giant bear hug. I realized that being in the company of other creative types made me feel confident and inspired. This past weekend was such a delight; it's a gift I'll never forget. From the bottom of my heart, thanks mom and dad! You can guarantee there will be a lot more GIFs in One Fine Day's future. 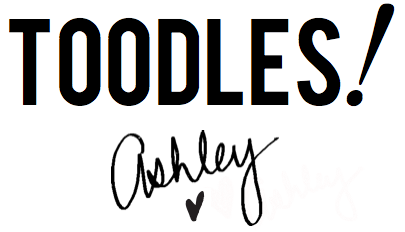 They're oodles of fun to create! Clueless about GIFs? Click here. Thanks to Angela, I came away from Blogshop with a handful of pictures of myself that I don't hate. It's a Christmas miracle! My eyes are open in practically every shot. I don't have to hide behind sunnies anymore! Yippee! Because the creative juices are flowing, you may see some tweaking (not twerking) going on around here! Nothing big, just a little TLC. Stay tuned. The skills I learned will take hours of practice and fine tuning, but I bet you'll notice a difference with time. Patience, m' dears! Okay, this note is mostly a reminder to myself. Big deal alert! I waited several hours before peeking into my Baggu of swag. Sometimes I surprise myself. I didn't take nearly enough photos. I think I was too busy people watching, and that's okay too! P.S. 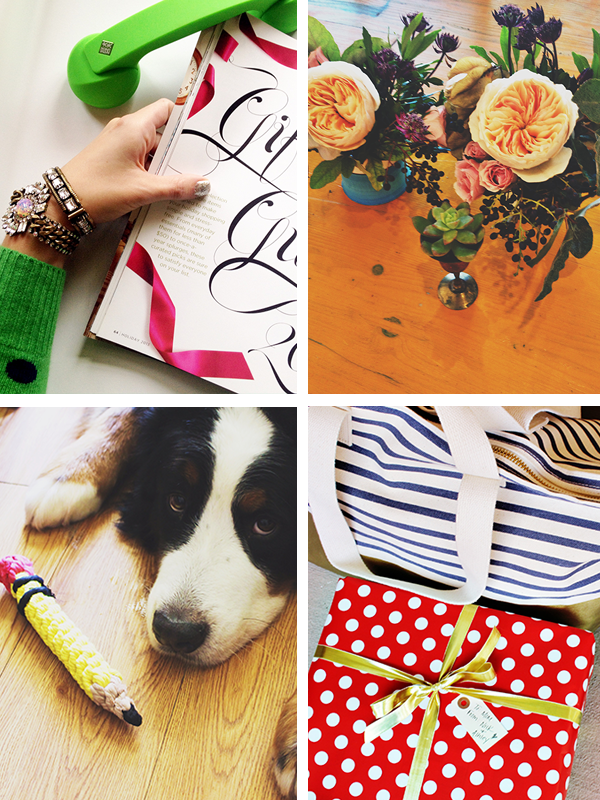 Have you entered the Aimee Sicora giveaway?! I was introduced to Aimee Sicora's work while poring over an issue of Matchbook Magazine. My eyes drew a bead on a quirky fashionista clad in stripes and sunnies. I couldn't turn the page until I learned more about the artist behind this fabulously chic character. Aimee was born in the quaint country of Wales and grew up in Great Britain. She graduated with a BA in Fashion Design in 2006. As much as she likes to snip and sew, her true passion is illustrating her designs. 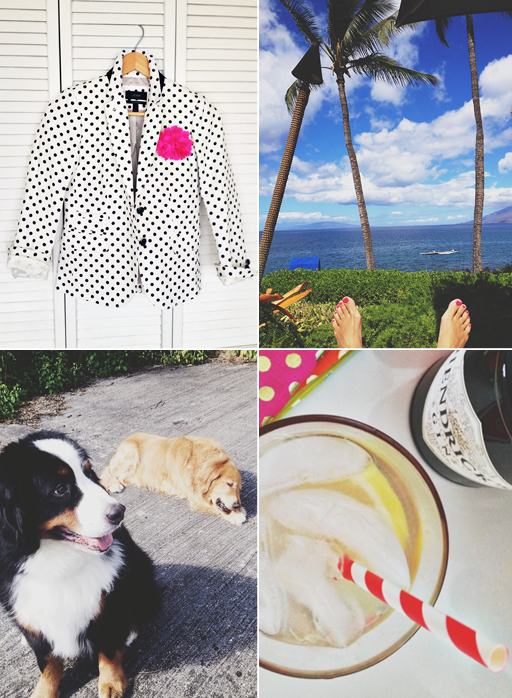 Today, she lives in Florida with her husband, Robert, and adorable dog, Minnie. Aimee spends hours tucked away in her sunlit office with gobs of paint and glitter —bringing little fashionable characters to life. How divine! When Aimee approached me about a giveaway, I was over the moon. There's a whimsy and quirky side to her illustrations that bring me so much joy. Lucky for you, one reader will get to choose TWO of Aimee's prints. Yipee! The winner will be announced this Friday, December 20th. Good luck, and go get 'em! For more about Aimee and her work, like her on Facebook, visit her website, and browse her shop! One Fine Day readers get a 10% discount on their orders through December 22nd with this fancy code: onefineday. Cover Lover // Allison Colpoy's designs have me drooling. Check out this interview, which includes some more of her amazing work. Amazing Face will be released in the U.S. January 2014. Emma Ballet Flats // Just when I found myself complaining about J.Crew's latest selection of ballet flats, they unveil these beauties and I'm smitten. I'm partial to the persimmon and bright kiwi. Natch. Austin, TX // This print by Matthew Taylor Wilson leaves me feeling giddy. Hello, weekend! Perfect Hot Chocolate // Five years of warmer temperatures has turned me into a cold-weather wimp. It's rather embarrassing! I'm constantly on the lookout for a hot beverage to keep my hands toasty. Herb Roasted Almonds // I'm going to go ahead and add the ingredients to my grocery list. Delish! Beanie Pomster // Sometimes it really stinks to have champagne taste on a beer budget. In case I win the lottery, I would snag this pom perfection in a hot second! Fab Freebie // This week, Kelly shared a handful of free desktop wallpapers that will leave you and your computer feeling merry and bright. Thanks for the festive fabulosity, Kelly! Nars Creamy Concealer // I picked this up in September, and I'm a HUGE fan. I wasted so much time looking for a concealer that works for me. I think I've found it with this one! Camera Love // Flyboy surprised me last Friday with an early Christmas gift. It was far too generous! Now I feel like the snazziest shutterbug with my fancy equipment and monogrammed camera strap. Mint Fleur Drops // Once again I find a pair of dangly earrings that are just lovely, but I can't wear them! Before I forget, a special congratulations to our HOLIDAY GIVEAWAY winner. This is the Seinfeld of all One Fine Day posts. Yup, it's a post about NOTHING! 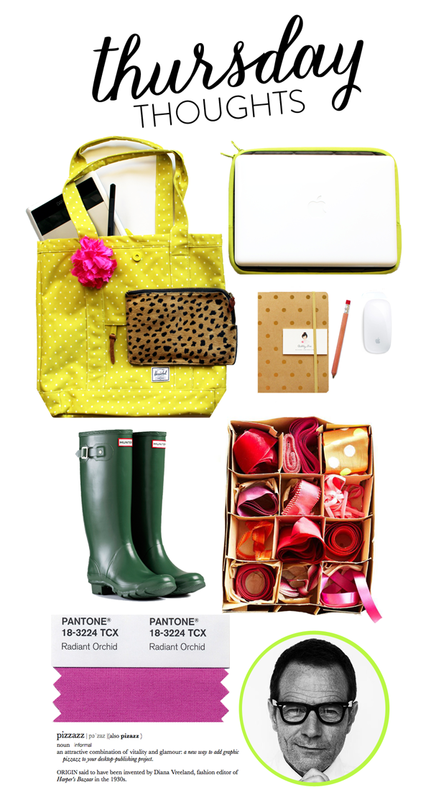 BLOGSHOP PREP // This is THE weekend, and I feel like a kid on her first day of school. Eek! I'm equal parts excited and nervous. I've got my outfits (somewhat) planned and my bag of supplies is packed. I'm a naturally nervous and intense gal, so I'm praying that I can just let my guard down, relax, and be myself. Thankfully, I was able to coax Flyboy into joining me in Austin for the weekend. Yippee! The pups are going to a local kennel for a spa date, and we're going to woop it up in the Texas state capital. Yee Haw! A SNOWY SITCH // Remember my predicament with Hunter wellies, or boots in general? I'll jog your memory with this post. Anywho, we're headed back to MO for the holidays, and it occurred to me that the only shoes I packed were flats and a pair of tennis shoes. Oops! In all actuality, we haven't really had to deal with winter weather for almost five years. Back then, I turned to my trusty Uggs, but I have a feeling those aren't "on trend" anymore. Thankfully, I threw my old pair away when we moved to Hawaii so you don't have to worry about me committing fashion suicide this winter. Long story long, I'm going to give Hunter boots another shot and throw a pair of fleece-lined socks inside for warmth. I really want a pair of duck boots, but after a long discussion with my mom, I think they'll cut me off mid-calf, only making me look shorter. In my next life, I'm going to have really long legs and this will never be a problem. Ha! PIZZAZZ // One of my all-time favorite words can be attributed to Diana Vreeland. I love the fact that it acknowledges her use of the noun as its origin. DV is the epitome of pizzazz. P.S. There's still time to enter the HOLIDAY GIVEAWAY! A winner will be announced tomorrow. The Blogger Buzz is back. This month, the ladies are hoping for something other than coal in their stocking. A new crossbody to wear throughout all the seasons. All gold, all the time with this gold feather from Williams-Sonoma. A place to hold all of our wine. I already have a place picked out for this print in my living room! The room is basically British themed and I love how punchy and bright this is! Evelyn Henson is really fantastic! This cake stand is so fun! I can just imagine putting fun cakes on this at the party I have to throw for my birthday bucket list! I need this necklace! I love the script and I feel like it would be a staple in my wardrobe and I could layer it with other necklaces! A chocolate bar that's equal parts pretty and delicious. Seriously, best candle EVER. I'm hoping for the "Aloha" scent. The Macaron foil art print from Jenny Bevlin — pretty please, Santa? I'm smitten with Meg Gleason's work. The pops of color and two-centuries old letterpress from which her products are printed. I die. This hand-bound "letterquette" is just lovely! Gin in a Teapot — I'm certain it was created with me in mind! Being punctual never looked so sparkly. This watch from Kate Spade would look snazzy on my wrist. 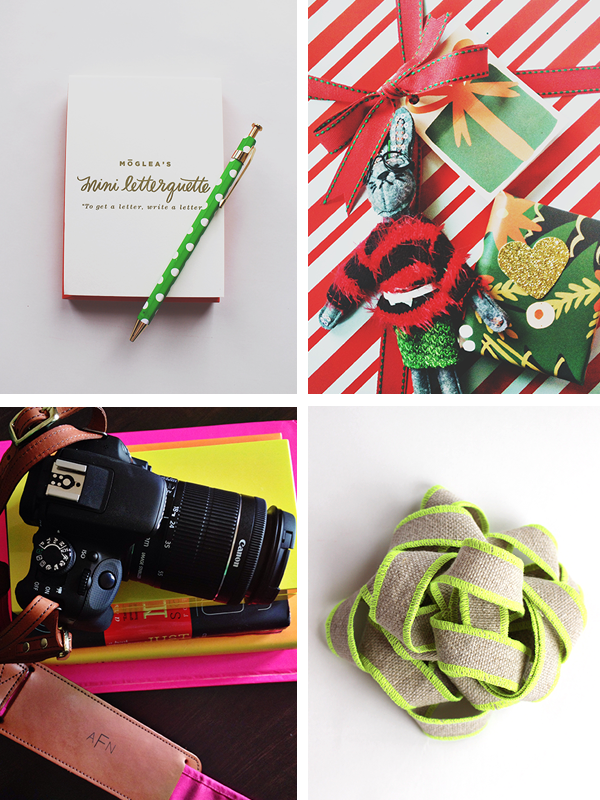 Tell us, what do you hope to find in your stocking? P.S. Don't forget to enter the HOLIDAY GIVEAWAY!!! Do you like wrapping gifts? Have any fun ideas that add a little flair your presents? P.S. There's still time to enter the HOLIDAY GIVEAWAY! The most wonderful time of the year calls for a GIVEAWAY — one that's filled with goodies as merry and bright as YOU are. I'm excited to announce that ONE lucky reader will win a handful of my favorite things, including a calendar and a set of note cards from Dotted Design. Woo Hoo! A winner will be announced this Friday, December 13th. Go get 'em! *Note: Aside from the Dotted Design products, this giveaway is not affiliated with any of the brands included in the giveaway. Ahoy, sweet readers! I interrupt this week's product-filled posts for a few words on authenticity. These thoughts have been lingering in my head for a few months, and I honestly didn't know how to express myself eloquently enough to make them publish worthy. After several failed attempts and feelings festering inside, here it goes! Many of us make the social media rounds numerous times a day. If you're like me, maybe you've noticed a lack of creativity and authenticity lately. I'm not here to point fingers, but it's rather frustrating. Inspiration is different than imitation. Believe me, I've made the mistake of confusing these two in the past. The more I learned about myself, the more I could let go of the crutch of being like someone else. It's freeing, my friends. The more in-tune you are to YOURSELF, the more genuine you become. Like anyone I'm a work in progress, but the more accepting I've become of my quirks, imperfections, and flaws, the more I've grown to like myself. Some of those quirks I wear with honor. If at ANY point, you find yourself replicating someone else in ANY way, whether it be the way they dress, style their home, design their blog, etc., I ask you to take a ginormous step back and ask yourself WHY. Sure, you may like the way THEY did something, but ask yourself how YOU could create a piece of work that matches your personal panache. What does it say about YOU? Is it a genuine expression of YOURSELF? You are beautiful and different, and that's flipping fantastic! Own who YOU are. Many bloggers and 'grammers have a similar aesthetic or interest — that's one of the many reasons we've connected via social media, and I love that! If we all squeal over fresh Peonies and skip to our local J.Crew, that's fine, but it doesn't define who we are. In fact, it would be incredibly boring if we're all the SAME. Instead, I believe we should be using social media outlets to make a statement about who we are as individuals. It's not about the number of followers you have or the number of hits your post receives, it's about putting yourself out there, quirks and all. Once we allow ourselves to be vulnerable and let go of any notions of who we think we should be, we'll discover someone who is incredibly genuine and unique. Why live life any other way? Do something because you LOVE it, buy the tchotchke because it's YOU and not because someone says you need it, design a post because it makes YOU downright giddy, style your home or outfit because it's an expression of who YOU are. For the love of polka-dots and fizzy drinks, please be YOU. Now go on and let those imperfections sparkle, darling! Tired of me and my soapbox? Click here for the Holiday Gift Guide. Unfortunately, we haven't had any snow, but there was about 10 days of cold and rainy weather. Yay for sweaters and scarves! Flyboy's first experience at Maggiano's. We left with enough Italian food for days! A piece of "happy" from a sweet friend. Beesly celebrated her fifth birthday by eating ice cream and skipping around the neighborhood. Life is good for this Berner. The aftermath of styling photos can be messy. Whenever I get into creative mode, I'm far from organized. It's the one time I'll allow it! Proof that we visited the oldest dancehall in Texas. It was just as charming as I hoped it would be! Less than two weeks until Blog Shop. I'm equal parts nervous and excited. I think I'll bring a stack of these bad boys! Instagram photos printed via Prinstagram to include in our Christmas cards. A sure-fire way to add a little snazz to any day. The colder temps meant I finally got to see Flyboy in his leather jacket. Looking good, Captain Handsome! The secret to a successful and cozy holiday season? J.Crew's Style Guide and a cup of Peppermint Tea. Sending happy mail to family and friends. Happy Monday, m' dears! I'm going to keep today's post short and sweet. The holiday season is upon us (Yippee!) and the ol' list is getting longer. But before I start tackling those to-dos, we should catch up. How was your weekend? Flyboy and I had a fantabulous Thanksgiving. We relaxed A LOT, stuffed ourselves silly, and watched an embarrassing amount of Breaking Bad. I won't even tell you how many episodes we breezed through, but can you say addicted?! We were late to the game on this series, but we're making up for lost ground. I can't wait to complete all five seasons so I can stop thinking about the show already. Before I rattle on anymore about Jesse, Walter, and this sick and twisted plot, I should assure you that I haven't gone off the deep end! The only thing you'll find me cooking up is another batch of snazzy Gift Guides, which will be featured the rest of this week. Can I get a Woo-Hoo?! Oh, and GO TIGERS!